How Deep is Your San Francisco Giants Knowledge?! Put your memory and San Francisco Giants expertise to the test! Q: Which numbers have been retired by the San Francisco Giants franchise? Interesting note, John McGraw and Christopher “Christy” Mathewson, who were members of the New York Giants prior to the introduction of uniform numbers, simply have the letters “NY” displayed in place of a number. Q: What moniker did the San Francisco Giants originally go by? A: The New York Gothams. The team was renamed the New York Giants just two years later. Q: What type of bat does two-time World Series champion catcher Buster Posey swing? A: Posey favors Louisville Slugger maple bats. 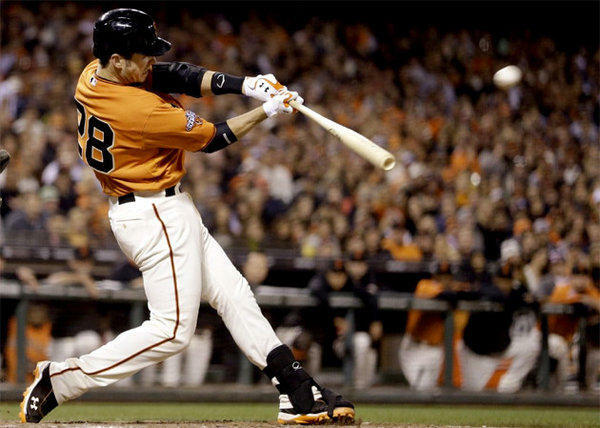 In just a few short seasons, Posey has risen to the top and established himself as one of the MLB’s top hitters! Q: Who founded the original baseball club in 1883? A: Wealthy tobacconist John B. Day and veteran amateur baseball player Jim Mutrie. The pair also founded the New York Mets. Q: What is the unofficial name of the cove just beyond the right field wall of AT&T Park? A: It’s been dubbed McCovey Cove, in honor of legendary first baseman Willie McCovey. The nickname was popularized by Mark Purdy of the San Jose Mercury News and Leonard Koppett of the Oakland Tribune. Purdy originally suggested ‘McCovey Channel,’ ‘McCovey Stream,’ or ‘McCovey Run’ as potential names for the body of water until colleague Koppett came up with ‘McCovey Cove.’ That lyrical name stuck and was quickly adopted by Giants fans. Q: How tall is Louisville Slugger swinging infielder Brandon Belt? A: Belt is a whopping 6’5″! Belt, Morse, and Bumgarner are the tallest players on the roster! Q: What are “Croix de Candlestick” buttons? A: The Giant’s former digs at Candlestick Park weren’t for the faint of heart due to extreme wind and cold. The Giants awarded bright orange buttons featuring an iced-over SF logo and the Latin phrase Veni, Vidi, Vixi (I came, I saw, I survived) to those fans who braved the conditions during extra inning night games. Q: The Giants once shared AT&T Park with another pro team, who were they? A: The XFL’s San Francisco Demons also occupied the stadium during the XFL’s one and only season. Q: Before Lou Seal, what was the Giant’s mascot? A: Crazy Crab. He was an anti-mascot and fans were encouraged to dislike him… and they did. He only lasted one season. Q: Whose birthday did the Giants ruin during postseason 2014 play? A: That would be Washington Nationals pitcher Tanner Roark. He was 27-years-old when he let up the home run to Brandon Belt, but officially turned 28 before the end of the extremely long game. Ouch.